Houses scattered among paddy fields and trees. The local villagers' hospitality is as overwhelming as their curiosity. Every stranger is a friend, who is invited to their homes to eat delicious food served with traditional hospitality. They appreciate my wearing traditional clothes, even if they wear readymade clothing themselves! Every house has a Buddha shrine on which a coconut oil lamp is lit nightly. Alms giving is a pervasive custom here. Local deities, when worshipped and respected, grant their wishes. In times of illness, western medicine is resorted to, although more often than not a kapu (spirit dancer) is called in to remove physical and mental disorders. The kapus' rituals range from simple mantras to all night dancing -- provoking, appeasing and removing of unwanted spirits. 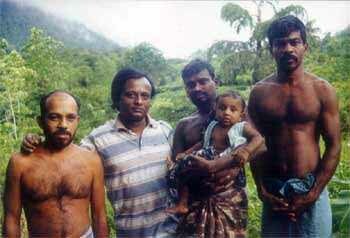 Many modern Sri Lankas are seemingly ashamed of their culture and traditional knowledge. Seduced by television and it's promise of consumer heaven, they move from their cool and comfortable wattle-and-daub huts, (which they know how to manage and maintain well) into more prestigious concrete boxes, complete with western furniture and appliances. Only poor people dwell in wattle-and-daub huts and live from the land, so I am told. Walking to and from the village is a social occasion. Each home and person passed must be acknowledged and greeted. A more personal �where are you going, where have you been and why' replace my English weather reports. People here love to keep close company with one another and suspect anyone who lives in solitude. Why did this group culture develop? From fear of the spirits of the forest, of whom they love to talk, or fear of themselves? 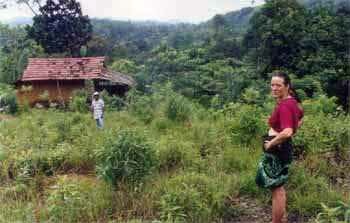 There are fewer and fewer people to be seen as I near my hut high on the edge of Singharaja rainforest reserve. The greenery everywhere cools the eyes. I cross the last rushing stream alone, silently thanking her for allowing me to return. The villagers respect our centre and regard it as an organic farm and ashram. 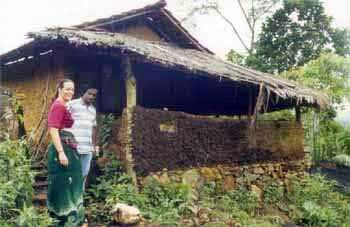 Our dwelling, a wattle-and-daub hut made from the surroundings, is painted inside with cow dung and different colours of clay, bringing the shadows of the forest within. 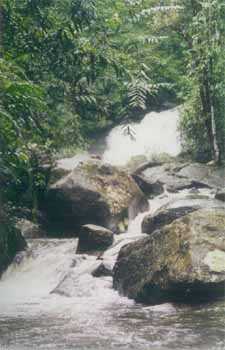 It sits upon several acres of land reaching up to the rain forest and down to the stream. We�re planting a forest garden, nurturing and encouraging plants, trees, flowers and herbs, asking the forest to take this abandoned tea estate back into her arms. She replies by sending daily miracles. Silently a leafless orchid blossoms amongst other rare and priceless gems. To the house streams of visitors come bearing small gifts and words of welcome. They want to know about my personal history and daily habits. The women want to touch my white skin and can't disguise their delight when I reach back, calling them sister or mother. The night brings the neighboring menfolk, bearing torches, the arrack (a local alcoholic concoction) already consumed. Singing, dancing and beating rhythm on the pots and even the door, and any other available instruments. I hide behind my art pad, drawing portraits while they hide their teeth. The women are satisfied. The men believe themselves to be more handsome upon seeing their portraits. The village is hosting a talented foreign artist, they feel. My neighbors are some of the few remaining who enjoy a hard yet rewarding life, which many in the West strive in vain to achieve. Although the tea cash crop provides for their clothing needs, the children's school requirements, oils for light and adds variety to their diet, the jungle is still their principal supermarket and hardware depot. My companion, their 12-year old daughter, already knows most of the plants and trees and whether they are good for food, medicine or suitable flowers to offer to the local deities. Their day starts before dawn and ends well after the sun has set. The day's mid-hours can be hot. The monsoons northeasterly December to January and southwesterly May to July, can make walking to town difficult even dangerous.  The latter of the two bring floods altering the infrastructure of the village, forcing those who persist in fighting against the flow to admit defeat and wonder at nature�s marvel. I cross the calendar, mark the weeks by the Saturday markets and the months by the moon. The gods are alive and well in the rainforest where a considerable percentage of Sri Lanka's indigenous plants, trees, butterflies and birds live as well as many medicinal plants. She has her own seasons with the drama and subtlety of many orchestras. Each family of instruments playing it's own interdependent tune, changing the colour of it's leaves, flowering, bearing fruit, a quiet rhythm of colours and miracles, dancing to the beat of the jungle's rain. Hear the sound of the birth blood rushing through her veins. As one's heart beats harder we know from the interior she's sending rains. The pulse becomes a roar; clouds rush overhead and the rain pours down, sometimes for minutes, for hours or even days. Falling heavily on the forest canopy, filtering down its layers. Rain gives life to the rivers and the land below. The sky clears, the sun bursts out bright and hot. Steam may be seen rising from the rocks, new clouds being born from her leafy locks. Beautiful forest embroidered in green, dark rocks glisten by the silvery white stream. Plants and trees flower, each an opening fragrant prayer to the gods of the forest, the rain and the air. Dreams are created and time is forgotten in this timeless setting. Leaches also come out with the rain; when walking in the forest it is wise to carry a pouch containing raw tobacco leaf, lime and salt on the end of a stick. Just touch the leaches with this and knock them off. They come, taking only a little blood and are easily removed. They do not spread nasty diseases nor bother you in your home, like men and mosquitoes. It is ill-advised to enter the forest alone. Mistaking an animal track for a footpath can result in serious, if not fatal, injury from trap guns set for wild boar, which, with the disappearance of their natural predators, has become a pest. Natural dangers include a poisonous spider which leaves its victims paralyzed and a small florescent green snake which aims at the eyes, blinding it's victims. The goddess of this rainforest is said to entrance unwary intruders with her beauty, rendering them spellbound and disorientated, to wander the jungle unable to find the way out. 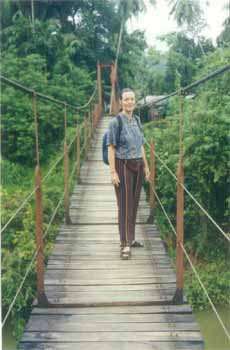 A few jungle wise men have confessed to being lost for days and say that many others have never returned. Waking each morning before dawn, to the sound of the stream, meditation becomes a way of life. Sitting on the verandah I watch the dawn mist rising, revealing layer after layer of diverse rain forest. I take my art pad and attempt to capture some of her beauty. My vision blurs, tears of joy welling up in my eyes. The more I look the more beauty I behold. With the sun's first rays she takes me in her hands and guides me through the day. Playing in the life blood, cool fresh water, laughter floating from the trees. Sunny days floating in the stream, her pulse filling my ears as I gaze at the overhanging jungle, doing nothing, living in the present. The full moon illuminates the rain forest like a black and white photograph. Fireflies and moon shadows, alive and magical. Sit outside on a rock under the moonlight and you will be spellbound, too. Do not watch the clock nor attempt to keep the time. Let the morning sun take you and lead you through Her rhyme. The veils of dust lifted like the morning mist calls up memories, tunes, even nursery rhymes that I could not previously recall, with the clarity of yesterday. People come and go like the forest ever-changing, ever the same. The cat and I become a small insignificant spectators of her orchestral play. I see the villagers chasing dreams spun out of the television sets. How can I ask them to see that my love of their traditions comes from the love of the rainforest? It comes from more than romantic ideas dreamed up in the comfort of a western home. Their suspicion as to why and for what I am investing my time in this discomfort is consoled by their certain knowledge that I can return to the West, catching a plane with little more effort than arranging a day trip, whilst they live in an uninsured world with two monsoons and a tea market in the hands of the stock exchange. Yet their natural generosity of spirit assures me of a welcome. I have been living among the gods in the Garden of Eden. Realizing the truth, having eaten the apple from the tree of wisdom, I am humbled. I cover my shame and watch myself trying to hide from God's gaze.